The Big Kahuna Combo Wet slide is ready to make a giant splash at your next party or event! This impressive bounce house/slide combo unit rocks a fun aquatic theme that includes a festive blue/red/orange color scheme and flair such as a set of colorful fish that sit on top of the unit and welcome guests to have a great time! This unit stands over 13' tall, features a safety step, large windows, and an outside hoop on the bounce house side of things, and an inflatable splash pad at the bottom of the slide, which is configured for wet use. Add a dash of thrills and excitement to your festivities and reserve the Big Kahuna Combo Wet Slide today! 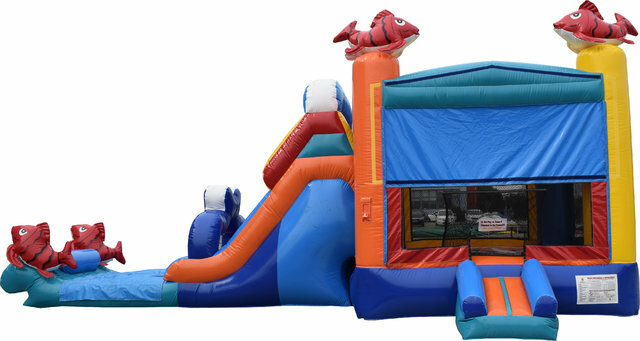 At Waco Bounce House Rentals, we are dedicated to providing you with quality party rentals at affordable rates.